Point Pleasant senior Trace Derenberger (50) drives past an Oak Hill defender during a Dec. 9 boys basketball contest at the University of Rio Grande Lyne Center in Rio Grande, Ohio. POINT PLEASANT, W.Va. — It’s not how you start something, but rather how you finish it. 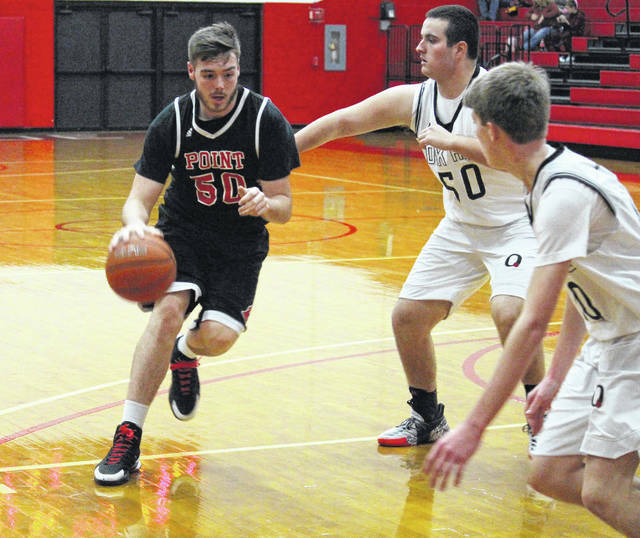 The Point Pleasant boys basketball team stormed out to a nine-point first quarter lead, but visiting Winfield followed with a 61-33 surge the rest of the way and eventually claimed a 71-52 victory on Thursday night in a non-conference contest at The Dungeon in Mason County. The Big Blacks (1-4) hit a three trifectas and a third of their total field goals in the opening frame, which allowed the hosts to storm out to a 19-10 advantage eight minutes into regulation. The Generals (4-1), however, went on the war path from there as the Green and White made a 23-11 charge in the second canto, turning a three-possession deficit into a slim 33-30 edge at the intermission. The Red and Black never recovered the rest of the way as the WHS — after netting 10 baskets in the second frame — hit another 10 field goals in the third period as part of a 22-7 surge that turned a one-possession lead into a commanding 55-37 cushion headed into the finale. The guests ended regulation with a small 16-15 run to wrap up the 19-point decision while also claiming their third consecutive victory. PPHS dropped its second straight outcome while also falling to 0-2 at home. The Big Blacks made 21 total field goals — including six trifectas — and also went 4-of-11 at the free throw line for 36 percent. Kade Oliver led the hosts with 15 points, with nine of those coming after halftime. Trace Derenberger followed with 11 points and Camron Long added nine markers. Malik Butler was next with seven points, while Kyle Martin and Evan Cobb each contributed three points. Braxton Yates completed the scoring with two points. Winfield netted 31 total field goals — including six three-pointers — and also went 3-of-7 at the charity stripe for 43 percent. The Generals had 11 different players reach the scoring column, with Braeden McGrew leading the way with 15 points. Christian Frye was next with 14 points, while Luke Kincaid and Andrew Huff respectively added nine and eight markers. Kolbe Rodgers chipped in six points and Jonathan Kennedy added five points, while Zach Simpkins and Brian Fisher each contributed four markers. Hunter Morris, Sean Hanshaw and Nate Vance rounded out the winning tally with two points apiece. Point Pleasant returns to action Tuesday when it travels to Calvary Baptist Christian Academy for a non-conference matchup at 7:30 p.m.